Can You Lose Weight on a Cybex Arc Trainer? A 2010 Journal of the American Medical Association study indicates that the prevalence of obesity in the United States drastically rose between 1998 and 2008 to 33.8 percent of the country being obese. Obesity is directly linked to serious health complications like heart disease, diabetes and cancer. Cardiovascular fitness equipment such as Cybex Arc Trainers can be effective at helping you lose weight. Combine that with a healthy, nutrient-rich, reduced-calorie diet for the best results. The only way to lose weight is by using more calories per day than you consume. One study conducted at the University of Wisconsin concluded that the Cybex Arc Trainer is the superior choice for calorie loss when compared to other low impact exercise machines such as the Precor Adaptive Motion Trainer and EFX 546i elliptical trainer. 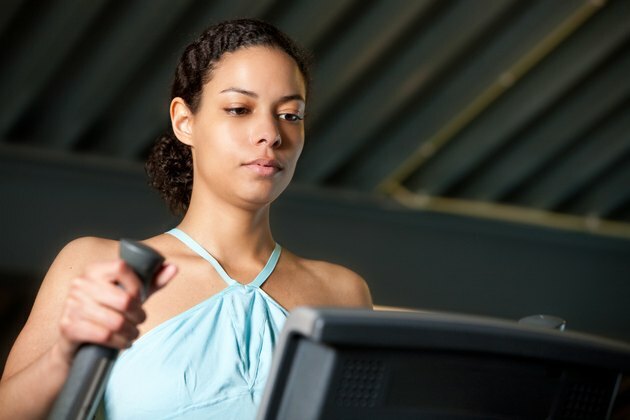 After examining 16 healthy men and women on each machine, the researchers found that the Cybex Arc Trainer burned 10.8 calories per minute, which the study determined to be significant when compared to 9.9 calories per minute on the Adaptive Motion Trainer and 9.3 per minute on the elliptical. One problem that is common with cardiovascular exercise is that it is easy for you to become bored with repetitive workout routines. The Cybex Arc Trainer avoids this problem by allowing you to move the foot pedals in any direction you choose. This allows you to train with an elliptical trainer motion one week and a stair stepping motion the next week. Adding variety to your program will keep your motivation level high and your fat melting away. When manually controlled, you can use the Cybex Arc Trainer in a near endless variety of motion, pace and resistance settings. However, if you are unsure of what program would best help you lose weight, you can simply use the weight loss program available through the electronic console. The program begins with a light amount of resistance and incline. These settings gradually vary over the course of the program during 30 to 60 second intervals so the intensity of the workout you experience is constantly varied. This allows you to exercise for a long time and burn large amounts of calories without becoming quickly fatigued. Using the Cybex Arc Trainer in a stepping motion rather than an elliptical motion allows you to effectively build muscle in your lower body. Though you may burn fewer calories per session with a high-resistance, slow-pace workout, the lean muscle mass you gain from this type of workout pays dividends. Muscle is metabolically active, which means it requires calories to maintain and repair itself. The more muscle mass you have, the higher your resting metabolic rate, which is the amount of calories your body normally burns to function without any additional exercise. What Gym Equipment Burns the Most Fat? How Many Pounds Can You Lose if You Work Out Every Day for a Month?